But I Am Definitely NOT Disappointed! Now as you all know, I don't collect puzzle boxes (except Stickman boxes) unless there is an additional feature to the puzzling but, in my defence, I didn't pay attention. 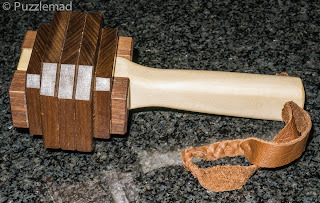 I actually thought that the puzzle might have been one of Stephan's amazing shaped burrs like the Droid which I have so far failed to solve despite trying on and off for several years or Thor's hammer which took me quite a long time and the fabulous Tokamak which he gave me in Paris. 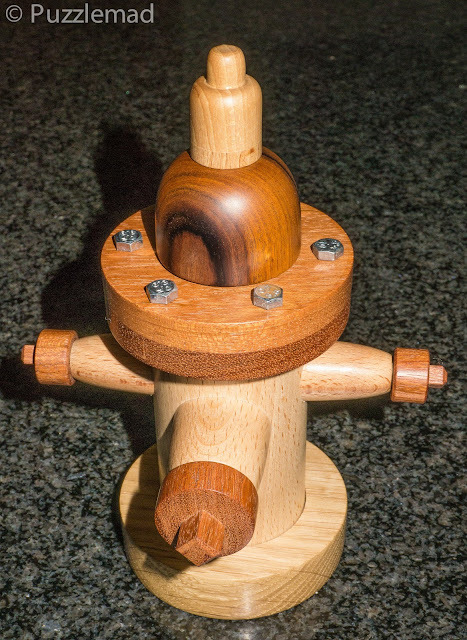 Once the IPP participants had deliberated and pronounced that they really loved the Hydrant (it was one of the "Top Ten Vote Getters", I contacted Stephan to ask if he was making any more of these for sale and could I buy one? He said "Yes" and "Yes" but I would have to wait as they were going to take a while to make. The intense puzzling that was done at the IPP showed him that the mechanism needed strengthening and this was going to take some design and workshop effort. 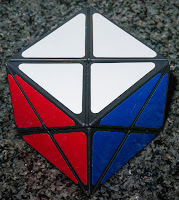 Of course, I was happy to wait for a nice and fully functioning puzzle which arrived many months later in February 2019. I was not disappointed - it is GORGEOUS! I played with it after taking some photos and realised that it was definitely not a burr. 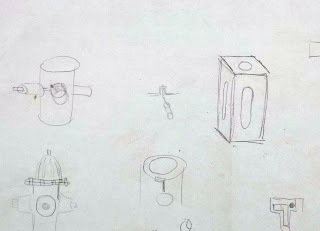 Apparently, Stephan had initially tried to make it as a burr aiming for the shape of the American-Darling B62-B5 Hydrant. His initial ideas produced a burr with level 29.6.4 (total 43). But he had problems building it accurately enough. 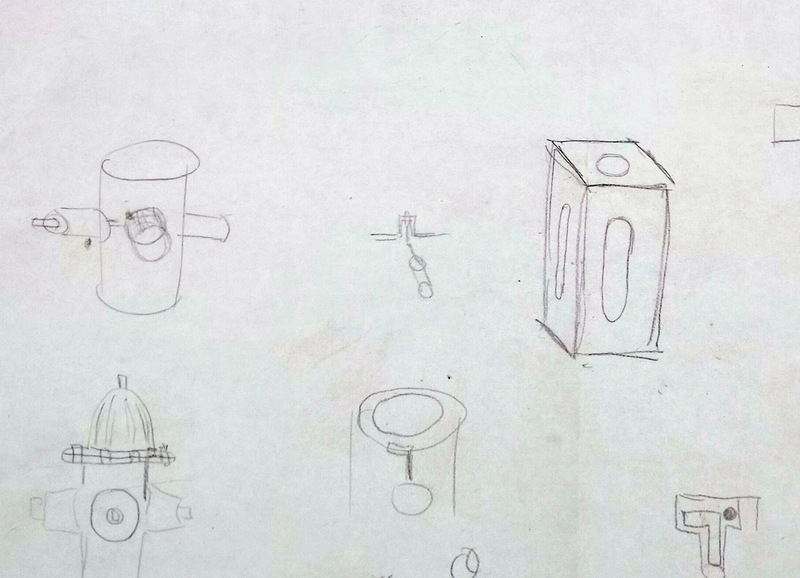 Prototypes were built and sample materials sought - the critical part of this puzzle was the end...finding the firehose. The part for this needed to be surprising and special as well as critical to the function of the design. 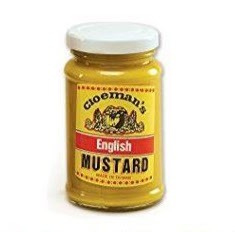 It would appear that Stephan bought a LOT of novelty English Mustard over the last year! If you've ever seen one of those trick opening jars with exploding snakes inside then you will know what is in the hydrant. But despite this now fully functional and robust model, Stephan is still primarily a wood craftsman and he really wanted to make it in wood again with the new improved mechanism. 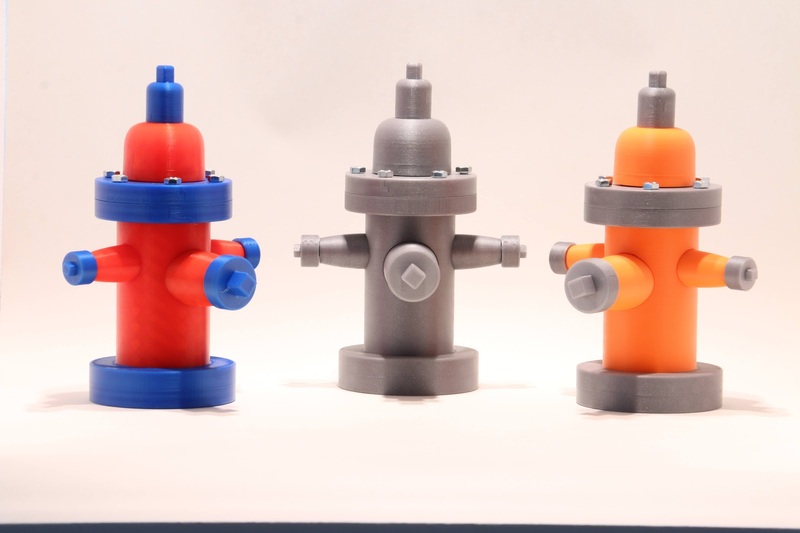 He had perfect designed and printed parts as templates and this allowed him to build the new series as he had initially dreamed but as a hybrid Hydrant. 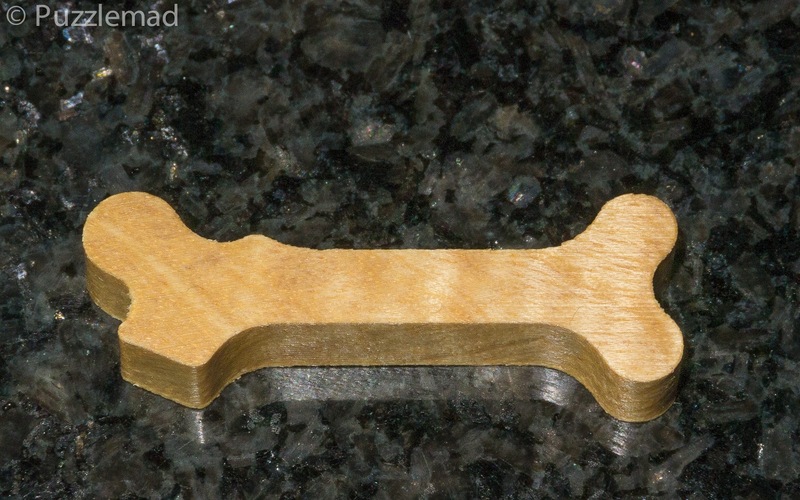 In this new series, two hidden parts are made out of wooden filament. As soon as Stephan showed off the pictures of the new batch, I knew that I was getting something beautiful and very well made. I realised very early on that this is not a burr - but did not think any further what it might be. There are lots of tactile pieces to play with and some move a bit, some move a lot, some wiggle ever so slightly whilst others are stuck hard. There are no external clues and pushing and pulling all available parts does not provide any real clues. Wiggling one protrusion does have an odd effect on another one but this did no more than confuse me. By pure chance I worked out the first step - it is quite simple but took me a fair while to find. At this point, I can see inside and can see.....absolutely nothing! Oh well, more fiddling blind. At this point, I realised that 2 (or even 3) parts were able to interact in an initially random way but the more I did it the more I could find a pattern and set up an image in my usually empty head. Quite a few things were happening but a crucial something was eluding me. Time for bed that night and back to it the following day. One of my few fortés is that I do tend to keep at things for a very long time. I did this here and my mental picture got better and better until I had a VERY big Aha! moment. Now I really could see inside and see something useful. Further interaction of pieces is needed but despite seeing inside and suddenly gaining even more insight, I was still unable to go any further. At several points during this next phase, I felt that everything I needed was visible but still the solution eluded me. Of course, I would not give anything away! Next, I had to work out the exact sequence of steps needed to go from a complete assembled puzzle to extracting the hose. There are quite a few distinct steps which must be carried out in the correct order and very precisely over 3 distinct phases. 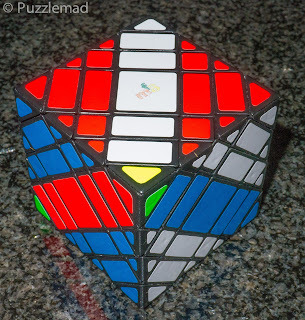 Resetting the puzzle is fun too as you must know those steps well enough to perform them in reverse. Brilliant! 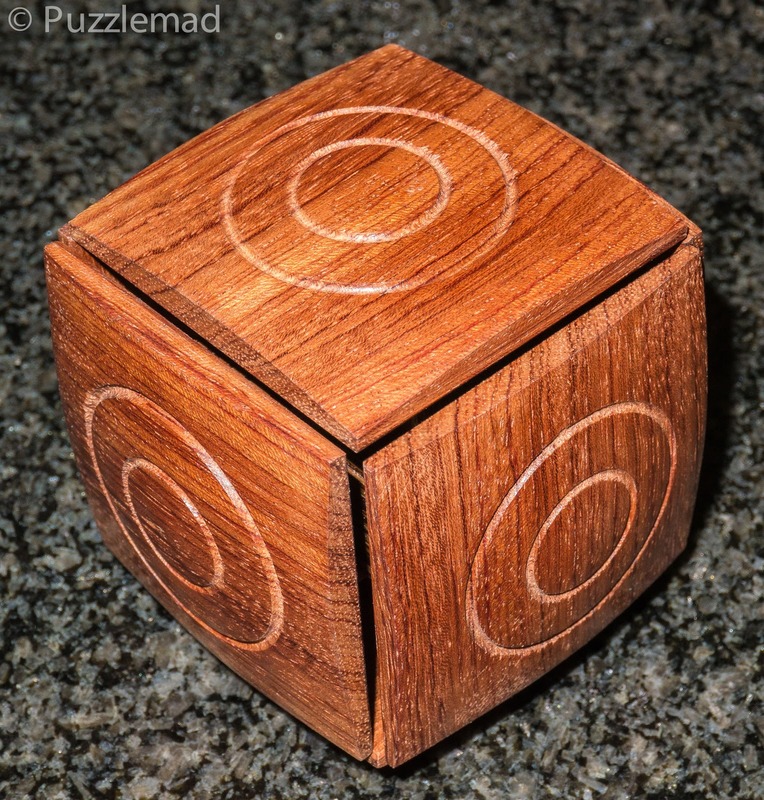 When Stephan told me that it is not a burr, I assumed that it would be a sequential discovery puzzle and I was wrong. There are no tools to be found in this. 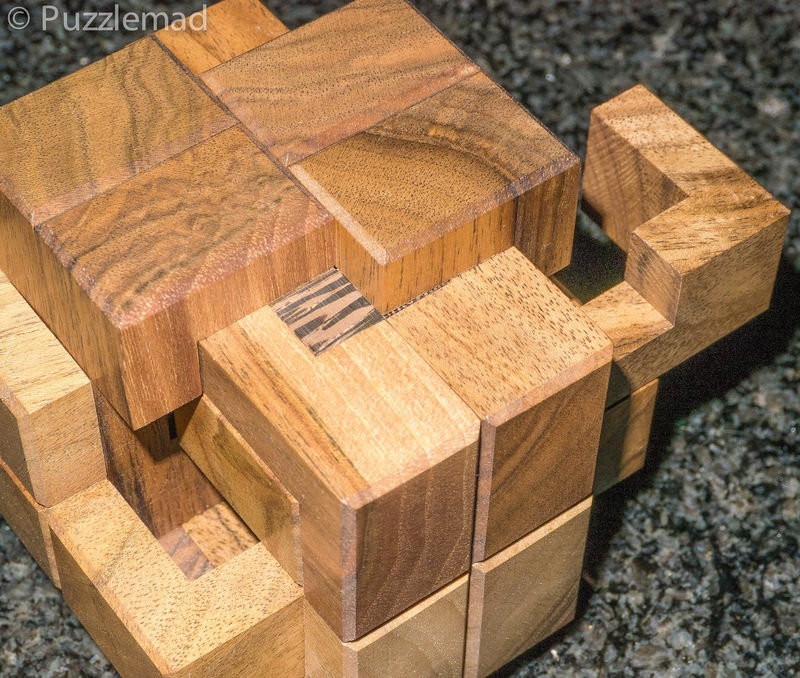 So what type of puzzle is it? 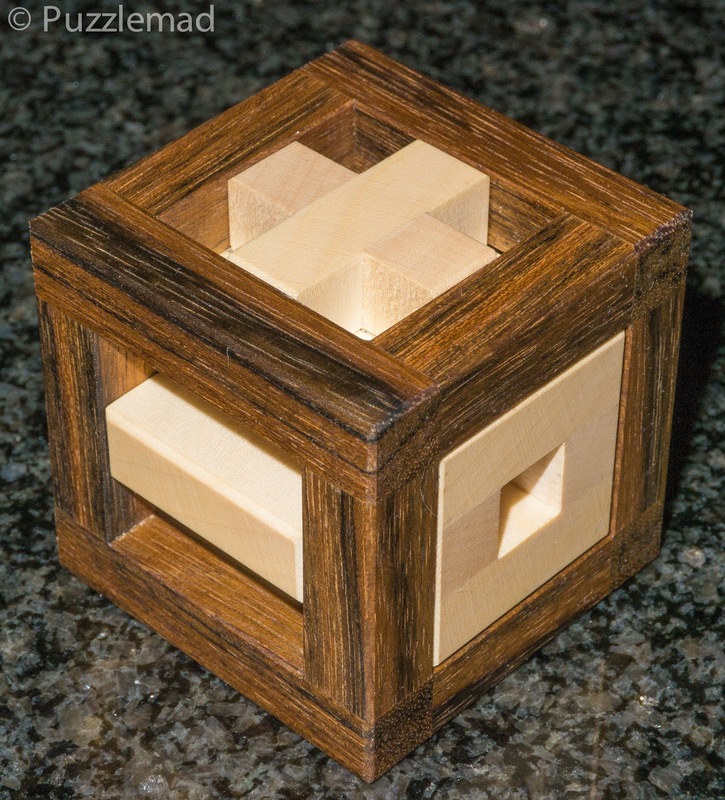 I thunk about it and have to conclude that Stephan has designed, made and sold me a puzzle box! I am not disappointed about it at all - it is a fantastic puzzle. It is made out of 44 different parts and is a triumph of ingenuity. I cannot wait to see what else he comes up with. Yes, I know that most of you puzzlers that read my blog don't really like twisties but you should give them a try - they are worth it and not that tough! Phew! Thank goodness this week has ended! I/we have had a horrendous week - it started with my 9-hour marathon rota writing marathon last Saturday leaving me thoroughly knackered and then after my restful Sunday of gym and blog we had a very unforeseen (and VERY expensive) visit to the emergency vet with a very poorly distressed cat! My pharmacology knowledge was tested over the subsequent few days after further vet visits and finding ways to dose our poor boy with all sorts of drugs to help him feel better. It settled then flared up and required rather large doses before finally settling again. Needless to say, sleep has been minimal, stress has been high, arguments have begun and gone secondary to it all and I am feeling quite frazzled. Puzzling was not high on my agenda but, like when I first began this odyssey all those years ago after a stressful event, playing with a toy certainly helped me focus my attention on something less horrible and get some stress relief. Looking at the photos above I know that you are thinking how can one of those awful twisty puzzles possibly provide stress relief? Surprisingly, these particular designs are remarkably soothing and one definitely needs to concentrate on them which forces most other thoughts out of my head - "She who must be listened to" would say that there is absolutely nothing in my head at the best of times and she might not be wrong! 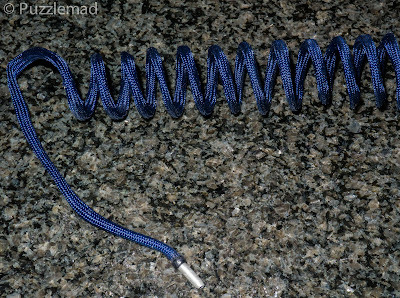 Twisty puzzles really do not need to be a source of anxiety and despair - I agree that the initial part of the learning curve is a little steep but once some basic ideas have been acquired and understood then solving a lot of puzzles is just a matter of understanding and a little time for experimentation. 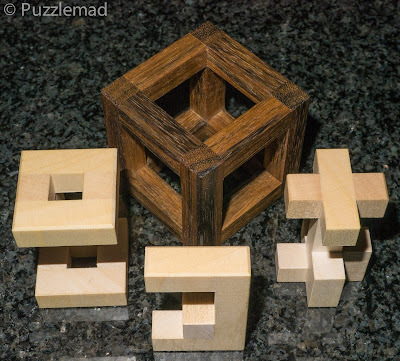 You should have noticed that both of these puzzles share a common feature - the cuts are oblique across the faces - they are corner turning puzzles. Straight away that should give you hope that the solve process will not be too difficult. 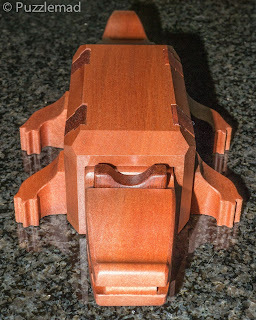 The Dino cube is a very simple corner turning puzzle where the corners are the full length of an edge but not beyond the centre of a face. 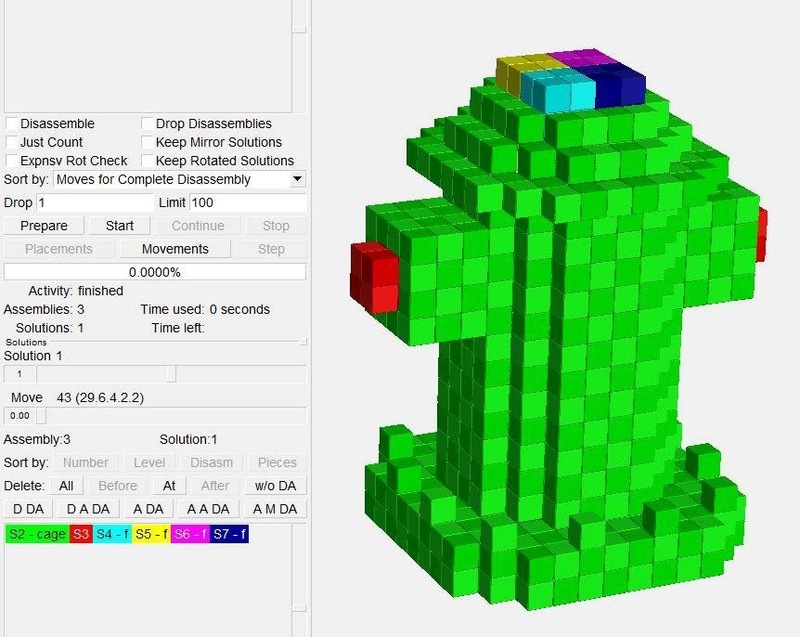 It consists entirely of edge pieces and is solved using a very simple up, up, down, down algorithm which effectively cycles 3 pieces into each other's positions. In the 4x4 version, the cuts have been retracted slightly and curved. They still do not cross the centre of a face and the end result is to create corner pieces and deeper corner pieces as well as more edges. However, the resulting puzzle can still be solved using the basic up, up, down, down mechanism. The difference is that one has extra pieces that need to be solved separately (the corners). The worry that using the up, up, down, down algorithm might ruin things positioned elsewhere can be ignored as the even number of moves of each adjacent corner means that the corner pieces do not get rescrambled. 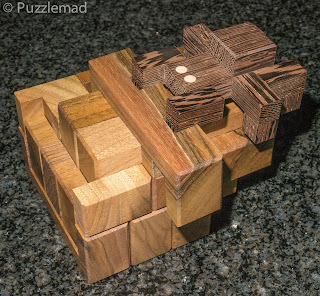 I attempted this puzzle first and scrambled it without even bothering to search for algorithms - I was that confident! Foolish? Yes! Always and proud of it! This simple algorithm has moved 3 blocks of pieces in one go. Now, something that moves lots of different pieces is seldom useful but here we can focus on just the inner edges. On that top left edge, the diamond-shaped blue and white pieces are actually one piece - it's a single edge as they cannot be separated from each other (think about it and the geometry). So if we just ignore the outer edge pieces we can use the basic algorithm to position ALL of the inner edge pieces alongside their corners first. It takes a while but, as long as one is systematic about it, and tries to end with edges on a single face as the last trio, then this is a fun thing to do. Suddenly we can see that we have isolated the outer edges and not moved anything else! At this point, it is useful to understand the concept of a "setup move". If the 3 pieces to be cycled are not in exactly the right places to be cycled easily then all that need be done is to perform a setup move to temporarily move a piece to the correct position, perform our wondrous 4 move algorithm and then undo that setup move. 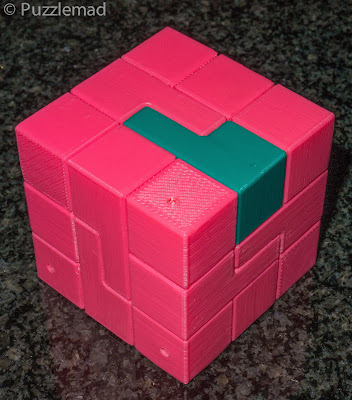 These setup moves can be simple or complex - as long as one remembers to undo them after the algorithm then the solution to this cube is trivial! Yep! 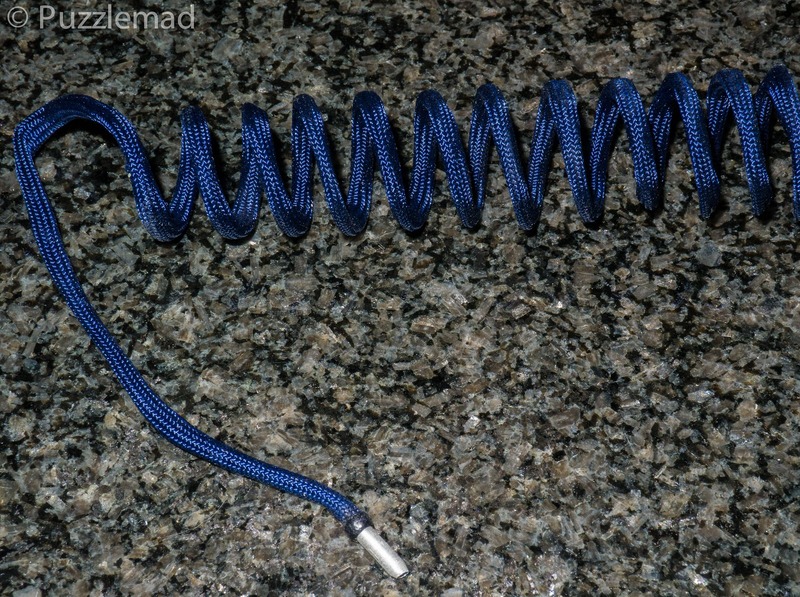 This twisty can be very soothing to the troubled mind! 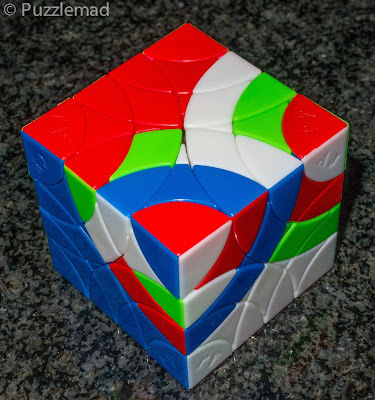 Next on to the Elite Skewb (can be bought from PuzzleMaster if you live in North America). This is based on the Skewb and the Master Skewb which I discussed back in 2013. 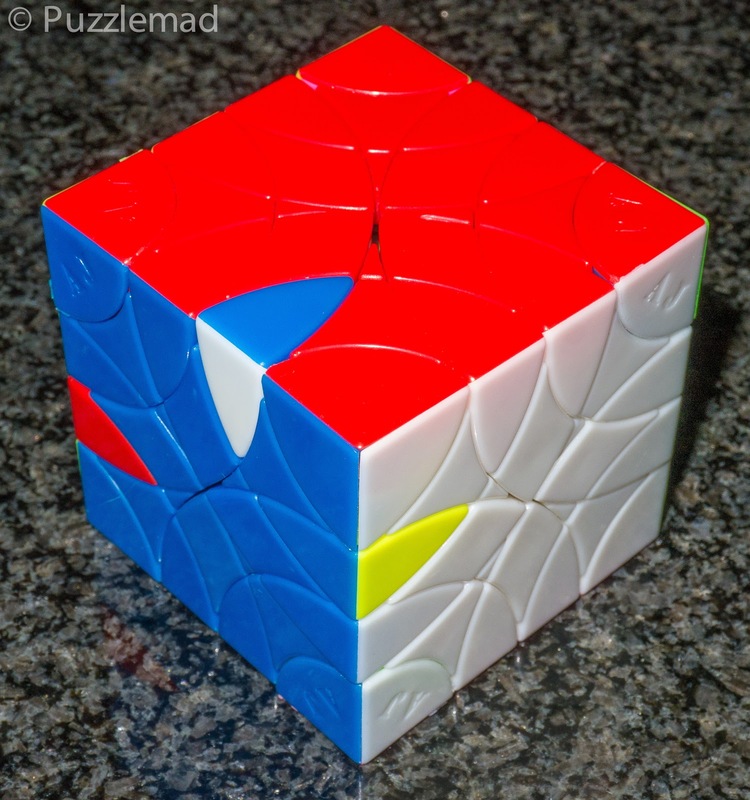 The Skewb is a very deep cut corner turner (think of it as like a corner turning 2x2 Rubik cube) and the Master version has shallower cuts too (this should be thought of as a 3x3 version). Ooops! Now I'm in trouble! With many of the higher order puzzles, the aim is to reduce the puzzle to a smaller one. 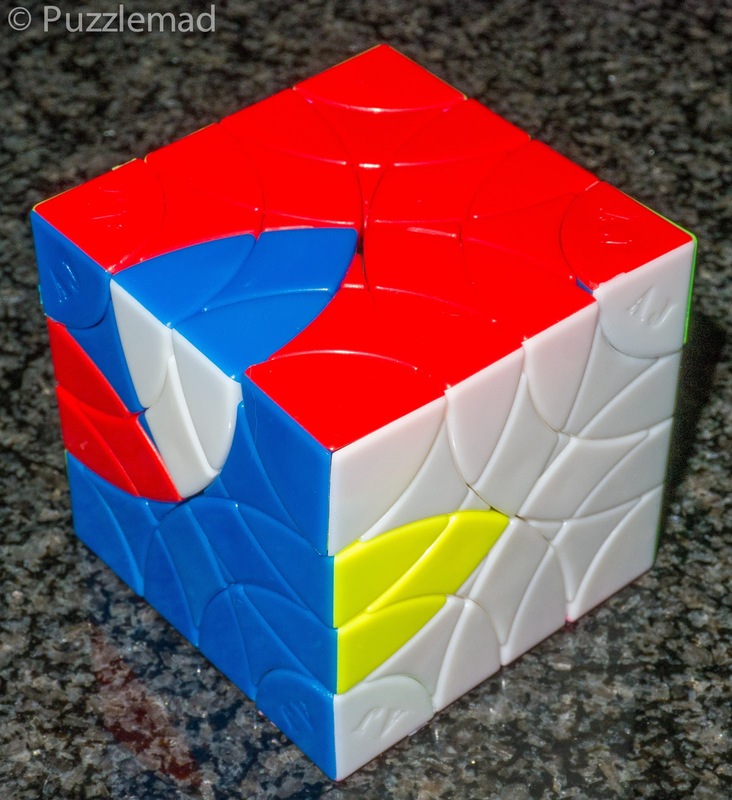 Hence a 4x4 or 5x5 Rubic cube is reduced to a 3x3 by combining pieces into giant edges and centres. It seemed like a good idea to try and reduce this to a Master Skewb. I would need to find a way to move all the tiny edges into pairs (there's one pair already made at the top front right edge above), then try to fill in the small squares between them to make nice big edges. After that, if I could pair up all the rectangular pieces then I would effectively have a simpler puzzle to solve. Easier said than done! My accidental scramble of this happened at the end of last year and I had only managed to work out a little bit of it. Pairing up the tiny edges proved pretty simple - the first 4 are trivial, just move the pieces into position next to each other. 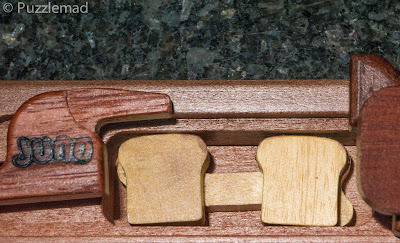 Then the rest are done by moving a piece into place, swapping a double-edge out with an unpaired one and undoing the slice turn to ensure the earlier solved pieces were put back into place. It takes just a minute or so to do them all....trivial! So, I had a way to move the small edges, the inner rectangles but I needed a way to move those blasted inner squares about. I was stuck! I have been trying to find a way for a good month or so now and not managed it. I sometimes go back to a modelling software called Gelatinbrain to help me play with different moves on my computer but it has not run on my Mac for over a year now. A week or so ago, during a frustrating and unsuccessful attempt I had a bit of an explosion - the whole thing destroyed itself and I was forced to reassemble it back to scratch and start again. This time, how about using that up, up, down, down but on just the inner slices? Looking at this, it would appear that 5 of the squares have been swapped around (this cannot be right if you know the "law of the cube". If one does it again then it is clear that 6 pieces actually swap - there are 2 groups of 3 which separately perform a 3 cycle. 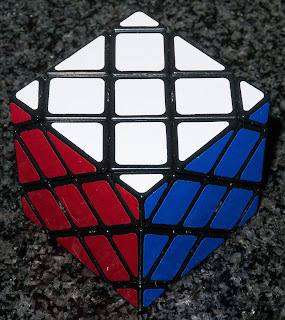 If the blue face is pointing towards you, then the top front red square swaps to the bottom right square which moves across to the bottom left. Now, this 3 cycle would be very useful if I did not get all the others moving at the same time. Time to Think© - it is trivially easy to swap out those combination edges (including the squares) around as one needs, using the usual algorithm. What would happen if I moved the top front combined edge to the side (blue-white position above) and in the process moved the bottom front edge up to that place? I could then undo the very first 4 move cycle that I did (i.e. up, up, down, down in the other direction). It required three 4 move cycles, with the last being the reverse of the first, and I had found a "simple" way to 3-cycle the square pieces. I was on the way. I managed to find that move on Sunday evening whilst trying to calm my nerves after my cat problem and I was on my way. 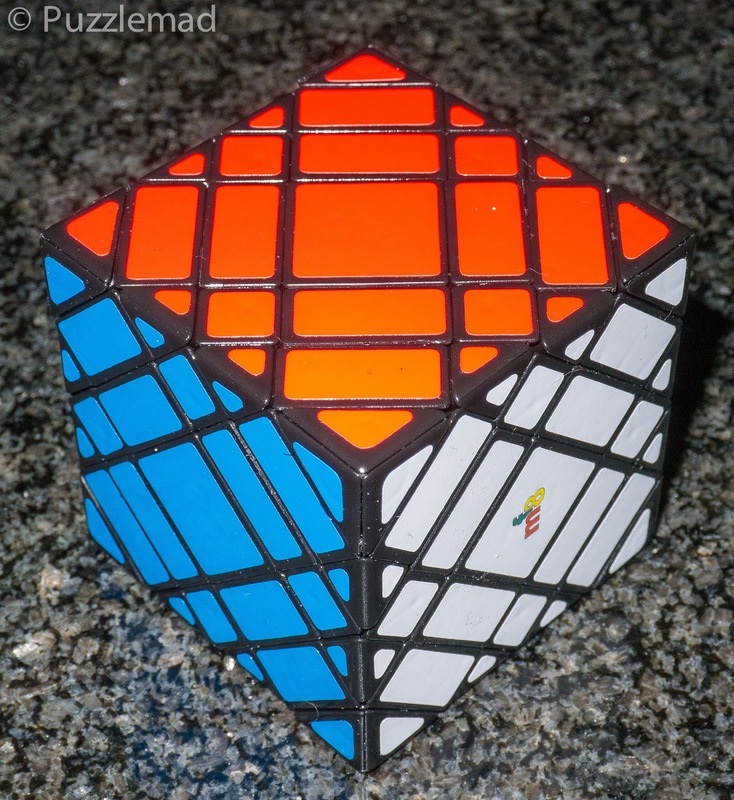 After discovering this method, it would be easy to reduce the Elite skewb to a scrambled Master skewb. The following day at work, whilst the radiologists were doing something under local anaesthetic and not requiring anything from me, I had a nice half hour to play. 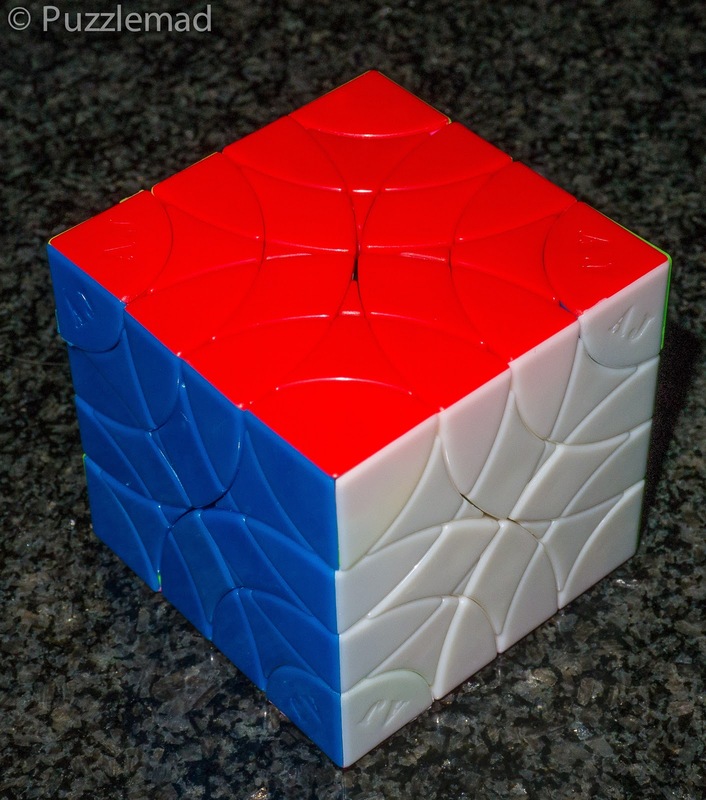 Reduce to Master Skewb? Check! 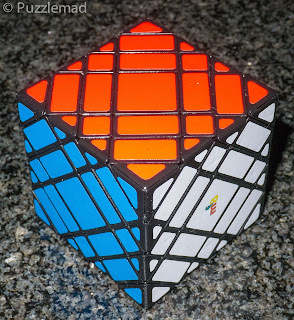 Solve Master Skewb? Easy! Check! 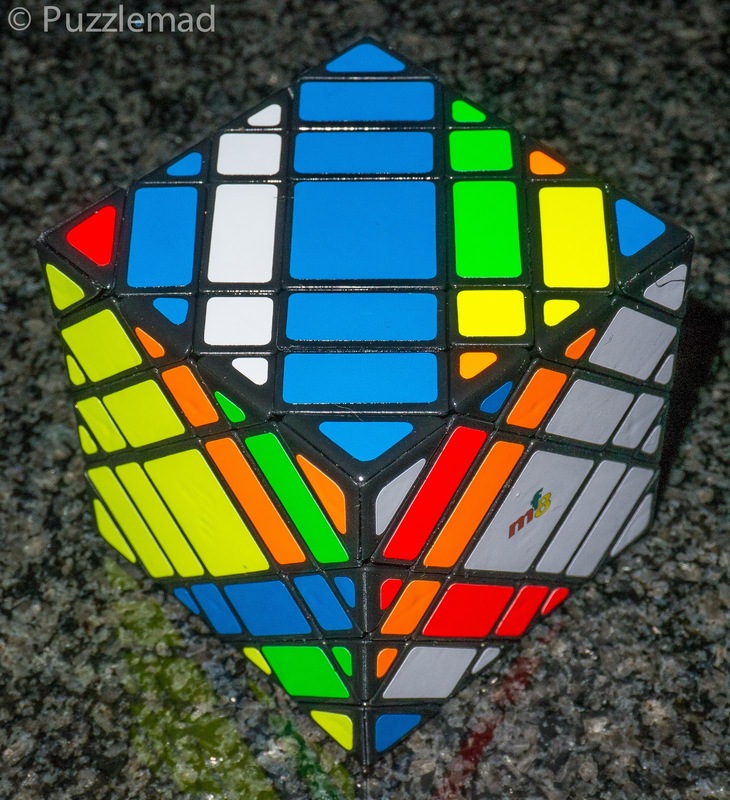 You should have seen the look on the nursing staff and other consultants' faces when I suddenly arose with a completed Elite skewb. The feeling of victory was wonderful! Yes, they all think I am crackers but I don't care! I have scrambled and redone this puzzle multiple times since then and have not found any unusual parities - it is a truly wonderful puzzle - an essential purchase for a twisty puzzler and really not too tough once one understands the 3 cycles required. There are NO complex algorithms to learn, it JUST requires the up, up, down, down method in multiple different places. Go buy one - you will not be disappointed. Next up I have some new toys from Stephan Baumegger. Grrrrr! Who's gonna bite first? 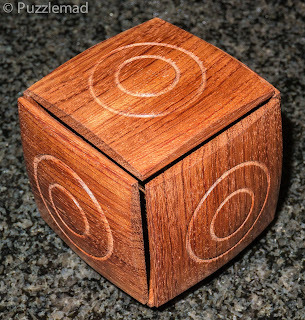 "The puzzle is a bit tricky to categorize but since it has an internal cavity, we can at least call it a puzzle box. 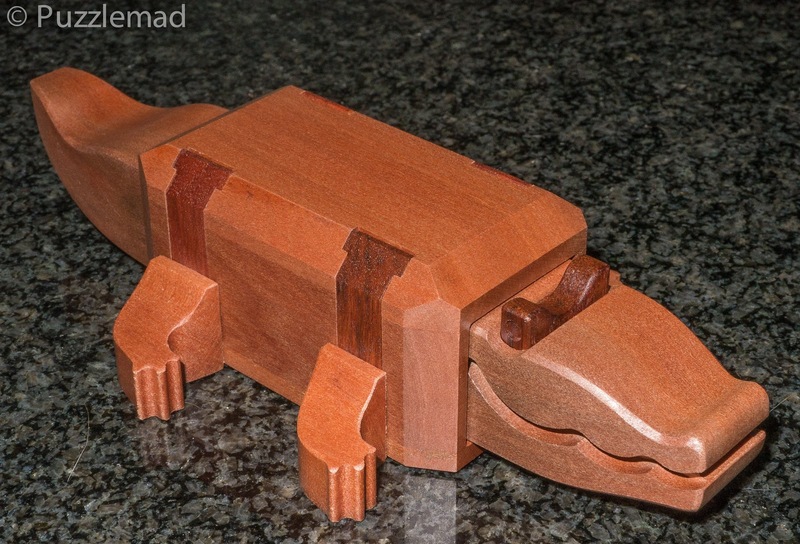 Juno’s initial idea of the puzzle was a burr or lumiki and its motif was a tortoise, and realizing it was a bit too skinny, he decided to modify its shape to a crocodile"
Is it a box? It does have a cavity but there is more to a box than just a cavity. 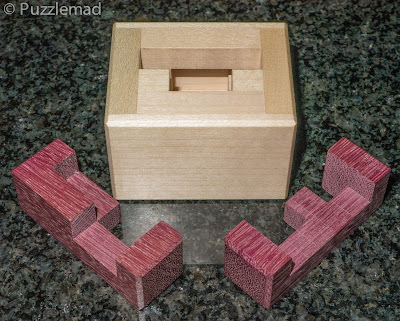 It could be a sequential discovery puzzle because at one point a tool becomes available to allow the final step to be done. Equally, it could be a sequential movement or even a hidden maze type puzzle as there are elements of all of these in the solution. Juno does state that it is not a very difficult puzzle but can be enjoyed by collectors and beginners alike. Above all, it is a gorgeously crafted wooden toy which has all the credentials it needed for me to add one to my collection. I have a steadily increasing number of Juno's wonderful toys in my puzzle cabinets. My copy got kidnapped by customs for a couple of weeks before I received a bill for a few quid in VAT and a whacking bonus for the Royal Mail for sorting it out! Grrrrr again! After the boyz had sniffed about at it and realised that it was not going to eat anyone they let me take some proper photos and get to work on it. At least he is smiling! Benevolently? "Find treats in the stomach of the chubby crocodile! We have produced a total of five kinds of stomach contents of this wild reptile and hid one or two of them in his belly." Why is this in the box? The treats in my copy look like they have been made of Maple or Koto. I had a suspicion that Juno and Yukari were playing more games with me because in the box I found a very cute little white CNC cut bone. My first thought was that this might be a tool for opening it but after an extensive search, there was nowhere for me to put it. I set it aside and wondered what was going on but continued to play. The eyes look like they might move and they do indeed wiggle a mm or so but nothing happens and I quickly move on. The crocodile legs are able to make him run and this produces a very interesting change in him and reveals a little of the mechanism. Not enough to open him up but a hint of what is required. Whilst playing with him I find that something was able to occur once but then I was unable to backtrack and eventually after I had backtracked, I could not repeat it. Further thought© required. I had to put it down to cook and eat dinner with the lovely Mrs S, who appeared to quite like this one because it is distinctly NOT a cube. She seems to have a thing against geometric objects! After dinner, I investigated further and quickly found the maze section and worked out how to manipulate my way through which produced a rather surreal end result. At this point, I found a flat plate which I could pull out and stupidly thought that was the end of it. I thought that the hole left by the lever was the "stomach" and I reassembled it at that point. Only the following day did it occur to me that if that was the cavity then where were the "stomach contents"? The bone I had found would not fit in there. DOH! I must have stopped and reassembled the puzzle before I had got to the end! Stupid boy! Putting this puzzle back together is just as much fun as the reverse sequence needs to be worked out and after that, it is yet more puzzling to establish the exact sequence of moves that will open it up every single time. For a few days, it became a bit of a worry bead for me - it is very enjoyable to play with. I will be interested to hear what other puzzlers found in the stomach of their crocs. Should you get one? It is very reasonably priced and there about 30 left in stock at the moment. I would say yes definitely - it is fun and lovely. 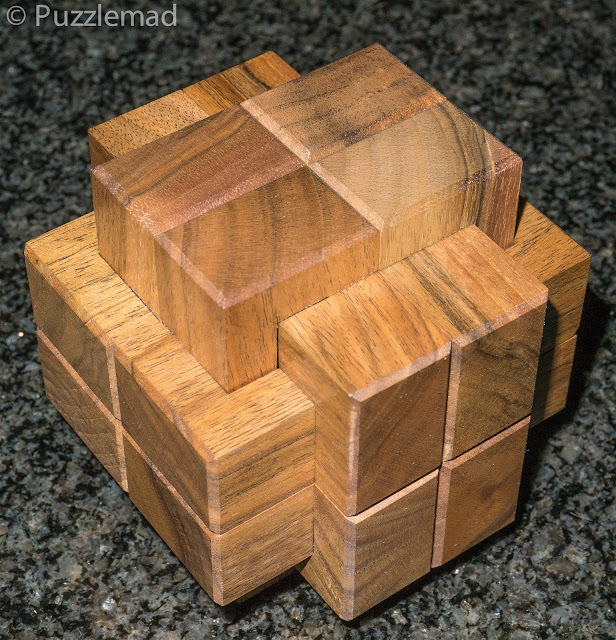 BUT there are a lot of new puzzlers who have been hooked by the lure of the sequential discovery puzzle. If that is what you are really most keen on then I would have to temper your enthusiasm by saying that the sequential discovery component of this one is only a very minor part of the solution and if that was your sole reason for purchase then you might be disappointed. 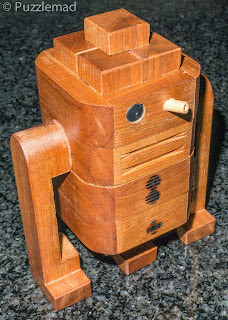 If you want a cute, beautifully made artefact with several aspects of puzzling and a nice couple of Aha! moments in it then you cannot go wrong with this. Above you see the latest puzzles that are about to be released by the New Pelikan Workshop. I am trying not to hold up the release this time. Jakub gives me the opportunity to buy the puzzles a bit early to allow me time to review them and write something for the shop site. He is very patient and will wait to release them until I have solved and written my blurb. I feel a huge pressure to try and do this quickly and a) let him make some money and b) let you have the chance to get some new toys. Thankfully this time there are only 4 for me to work through and the 13 piece burr I have had since Xmas when he sent me the Aracna as a gift. Let me say that you will not be disappointed with the puzzles about to be released. 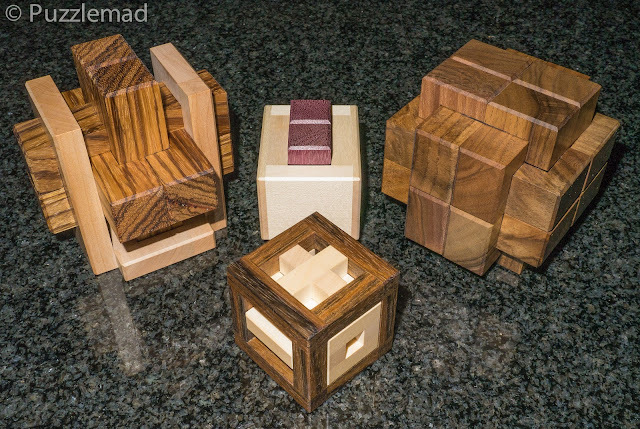 The Aracna is a stunning and quite large (88mm cubed) 12 piece burr made from Walnut with a hidden interior piece crafted from Wenge and Maple. 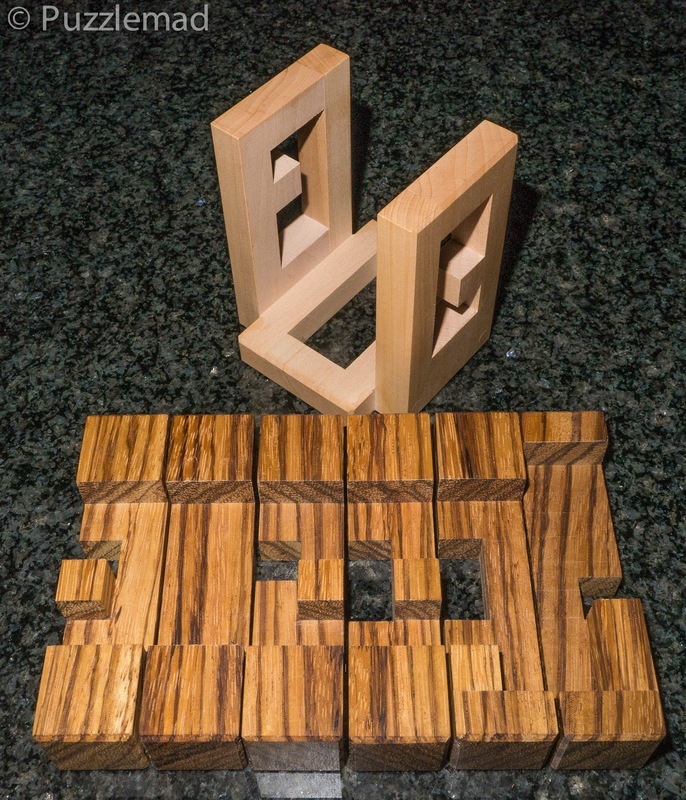 The grain in the wood is gorgeous and, with the smooth finish and lovely bevelling, it is a fabulous puzzle to hold and play with. This puzzle was designed by the incredibly prolific and talented Alfons Eyckmans and is part of what my friend Goetz calls the Burr zoo - that is straight-forward looking burrs (12 or 18 piece) which contain one or more hidden extra pieces in the shapes of animals/creatures. 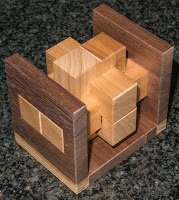 I have quite a few of this type of puzzle from several craftsmen and absolutely adore them. They can be made very complex to solve, especially when the hidden pieces need to move inside the puzzle to free up space for the external burr sticks to move. Sometimes the hidden nature of these interior moves can make these puzzles almost impossible for most "normal" puzzlers (if any of us can be considered normal). Jakub and Jaroslav have really great taste when choosing the puzzles to produce - they home in on puzzles that are both beautiful and also solvable without being resorting to the computer. This is one perfect example. I started playing with this one just after Xmas when I had a little time (I worked through most of the holiday period this year). Despite having a relatively easy disassembly level (13.2.2), I seemed to struggle for quite some time. There are only a few possible moves early on and then suddenly about 6 or 7 moves in, the decision tree rapidly opens up and there are quite a lot of possibilities available to choose from. I sheepishly have to admit that I got stuck for a while at this point - I became obsessed with one particular option and kept trying to follow this path without making any headway for a good week or so. There is also a sudden movement which will release a piece to a very enticing rotational move. This needs to be ignored - I did attempt to produce a cheating shortcut with this rotation but, apart from distracting me a while, got me nowhere. When Jakub asked for a review of this as well as the other 3, I was forced to focus my attention properly for a day or so. A systematic review of the possible moves might (just possibly if you are lucky) allow you to hold this puzzle just perfectly and then a very clever multi-piece move can occur. 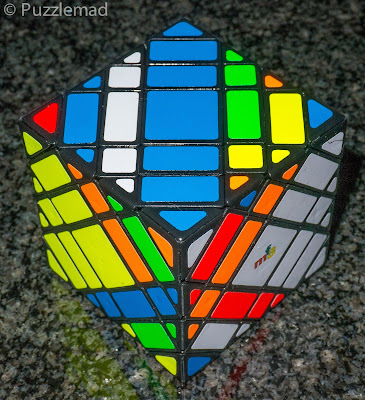 Once you have found the clever move then all of a sudden a whole bunch of new possibilities appear and it is only another couple of moves to remove the first piece. From this point, it is fairly trivial to disassemble the rest but is still enjoyable as the puzzle remains very stable in one piece as you remove more and more pieces. I think that it only collapses on you when you are down to the last 4 pieces. Looking at her and about to pounce! Looking for Mrs S? 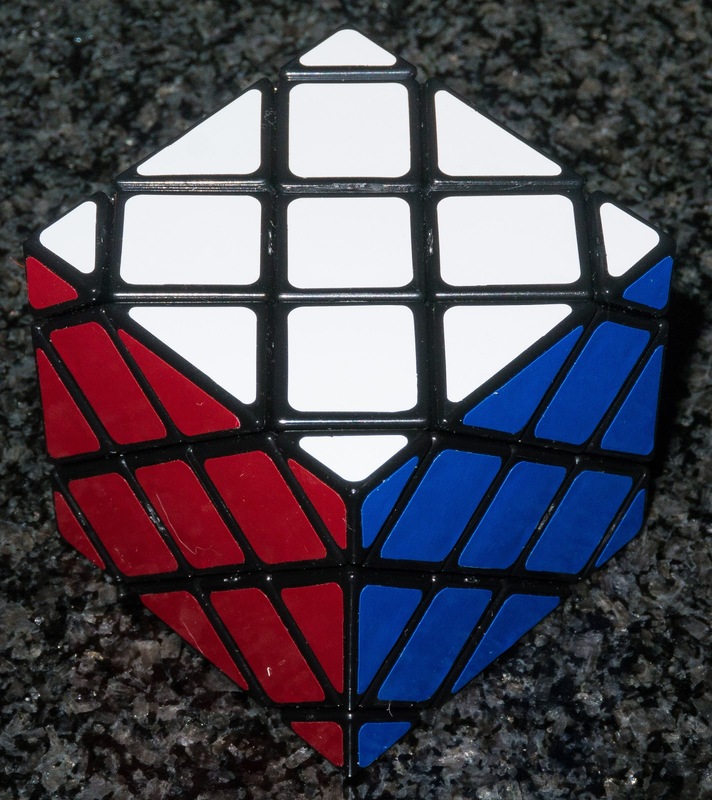 A wonderful puzzle! I recommend this puzzle to all of you who enjoy burrs - it is just the right difficulty level, with a great sequence to discover without getting too badly lost and a nice Aha! moment. Maybe not perfect for utter beginners, anyone else will really love this and who can resist shocking their spouse/girl/boyfriend with a hidden spider? It is brilliant! 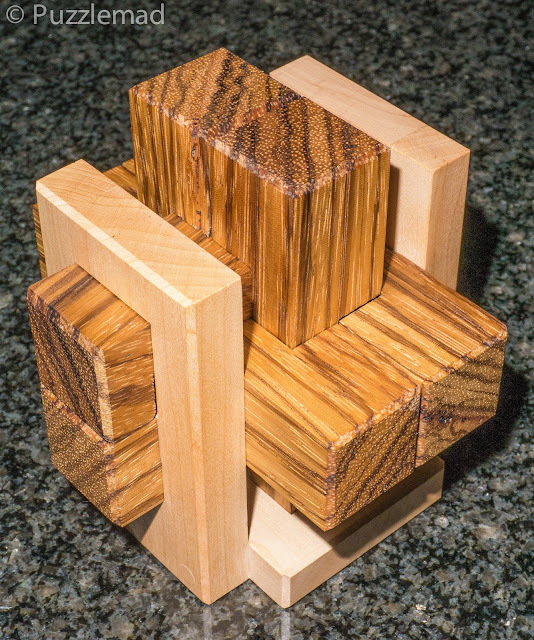 Pandering to our American friends with the incorrect name, Math (we all know it should be maths shortened from mathematics), this puzzle, designed by another friend, Klaas Jan Damstra, is the second in what I hope will be a whole series of themed puzzles. It is very similar to the fantastic Addition puzzle released last year (which, surprisingly, is still available from the Pelikan site) - the mathematical symbols have changed to a +, - and zero symbol in each of the 3 axes. 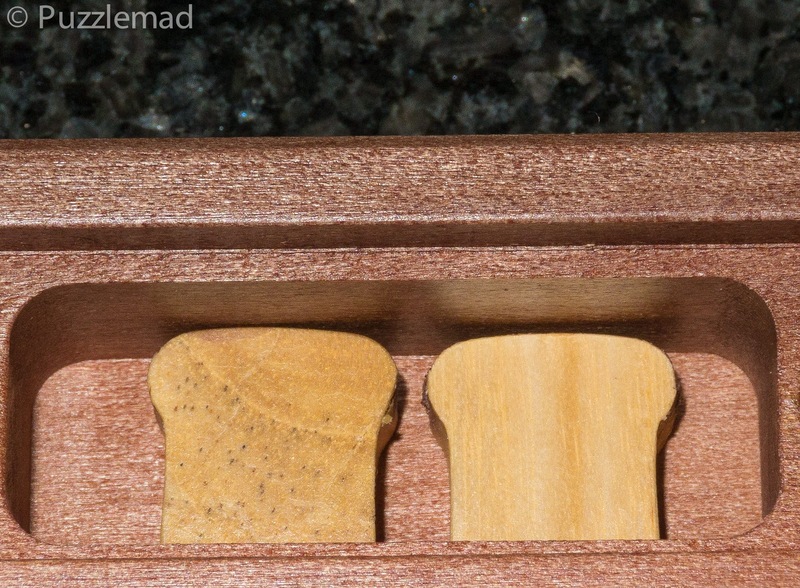 Like it's predecessor, the puzzle consists of a simple cubic wooden frame and 3 fairly complex burr sticks that traverse it which will need to be removed from the frame. 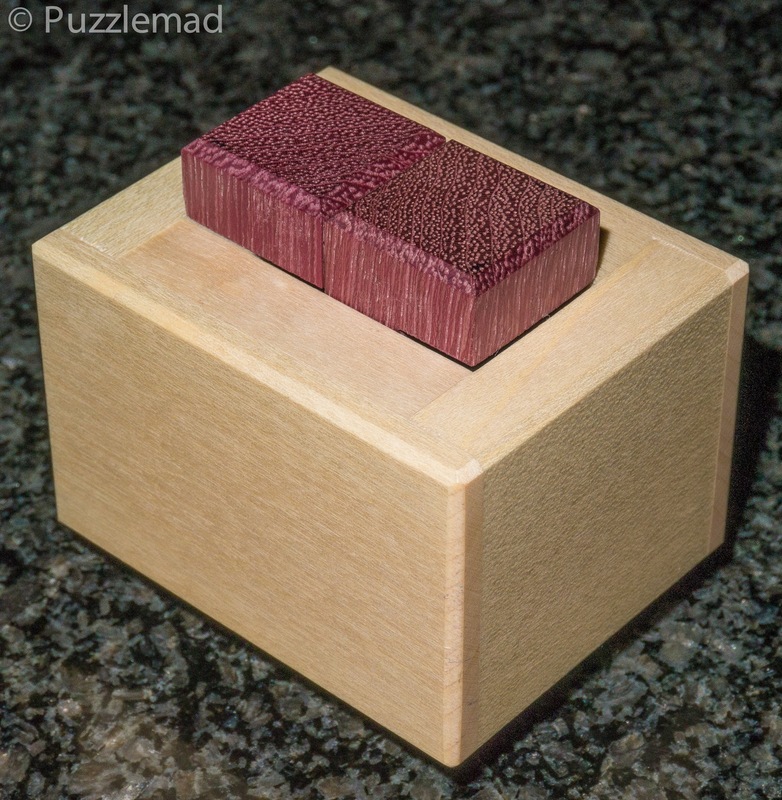 This is a fairly diminutive puzzle at 50mm cubed (like the Addition). There are two wood combinations available - Mahogany and Maple or Ovangkol and Maple - my copy was the latter. For such a simple design this has a surprisingly high level for the disassembly (15.2.2). There are a few moves initially that are quite easy to find and then the next moves can be quite tough to work out. everything is visible through the cage but working out exactly what is possible proved quite awkward. This took me a very fun hour or so to work out - with one particularly well-disguised move causing me a real problem. I knew what was required but couldn't seem to find it and eventually the Aha! moment was a delight. 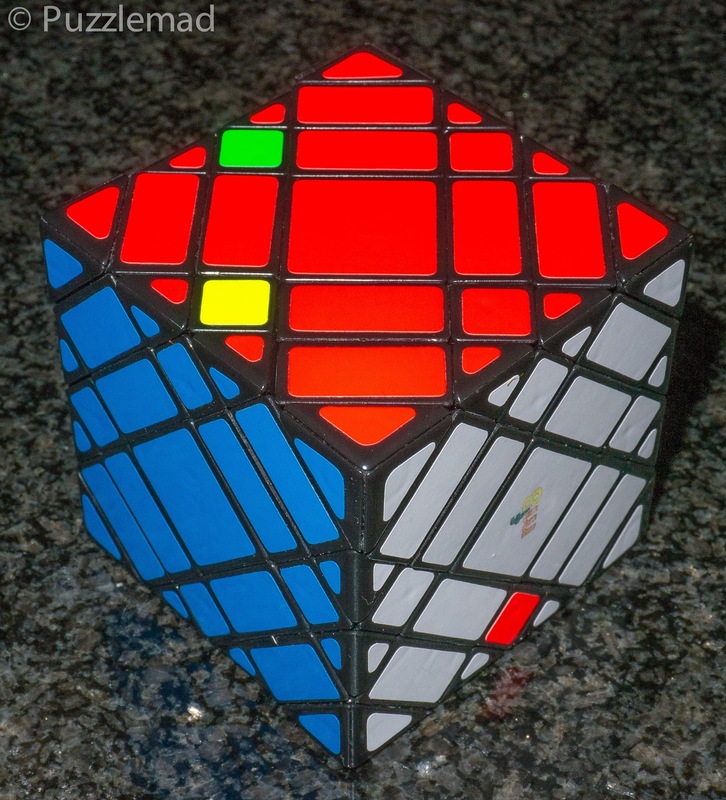 There are no blind ends to confuse you and I think this is slightly easier than the Addition puzzle. 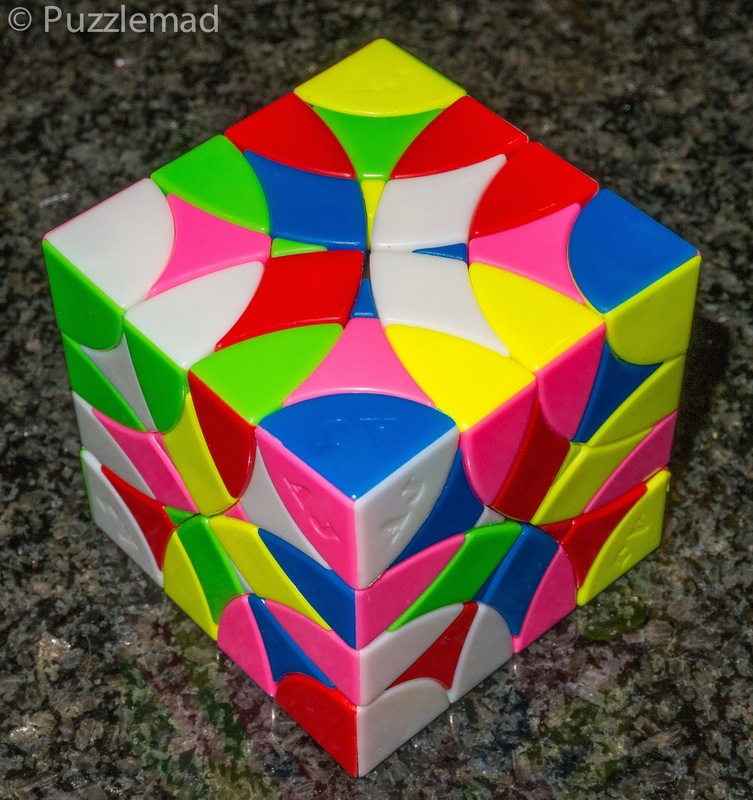 A rotational move is possible but this is not helpful - if you have bought the Addition then you must try and find the rotational solution as well for an extra challenge. Just 3 pieces in a cage! If you bought Addition then this is an essential purchase and if you didn't then quickly buy it now along with this one. They are both great little challenges and, as always with Pelikan, are beautifully made. The puzzle above is Angelus designed by the unbelievably talented and prolific Stéphane Chomine. 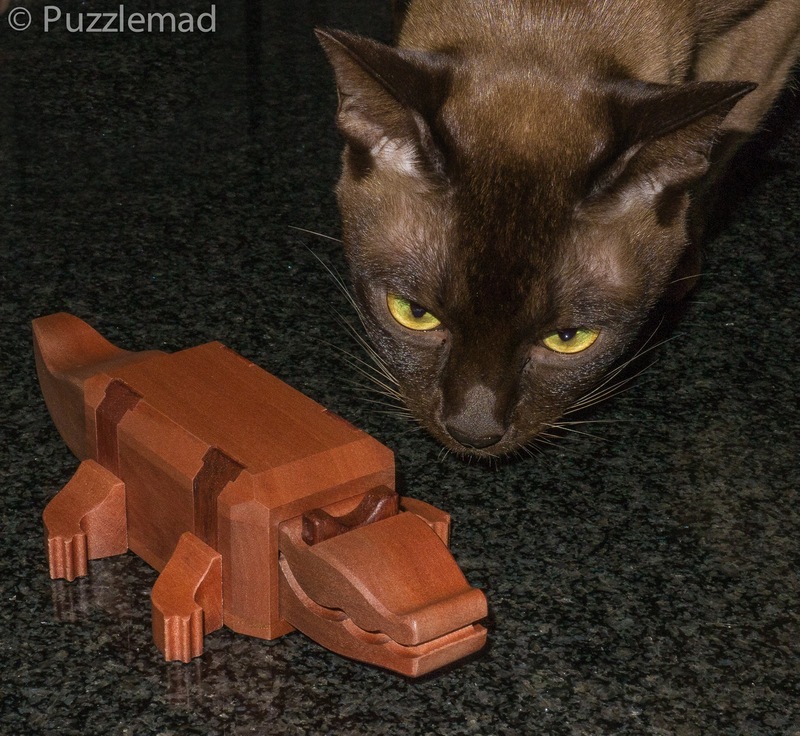 He designs puzzles of all different complexities but he seems to be particularly good at finding a relatively simple external shape that has a much more complex and interesting solution than would be expected for the number of pieces and the shape. Angelus is another such delightful surprise - there are just 2 burr sticks held in a simple frame but with a level 19.2 disassembly. 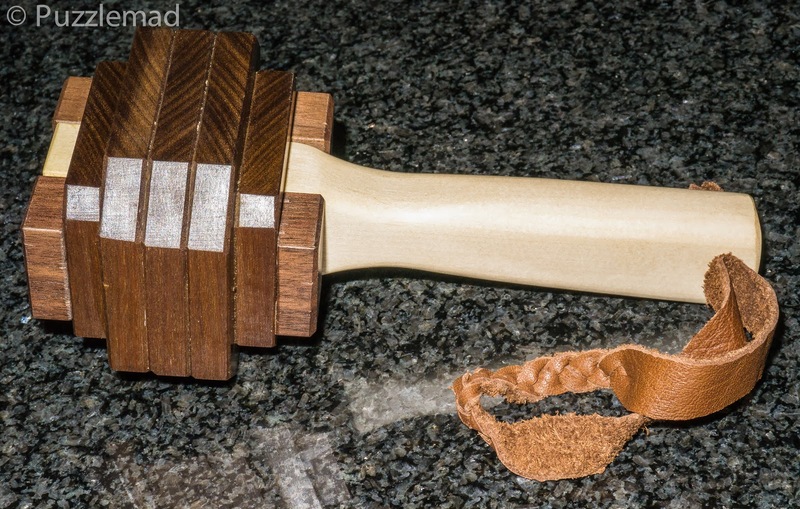 Jakub is releasing this in 2 wood combinations - Maple frame with either Wenge or Purpleheart sticks. It is also a nice pocketable size 60 x 58 x 48mm and beautifully finished. The quality of the workmanship can be seen by looking at the lovely shoulder joint on the frame in the picture above. The pieces move in a fun dance around and over each other and the sequence is relatively easy to find to the disassembly. With 19 moves it is very enjoyable and then yet more fun is possible - a fantastic challenge is to scramble the pieces and leave them a while (to ensure you forget the disassembly sequence) and then try and put it back together again. It is really fun and, despite the high number of moves, is very logical and doable by all puzzlers. Even if you are not a "burr person" this is a very nice fun challenge and well worth adding to your collection. I have found myself playing with this like a very large worry bead for the last few days - very tactile and great fun. The final puzzle (and the Pièce de résistance of the group) is the Blocage, also designed by Stéphane Chomine. I absolutely adore 6 piece burrs in a solid cage and was delighted to get the fabulous series of constrained burrs (designed by Logan Kleinwaks) from Eric Fuller a few years ago. 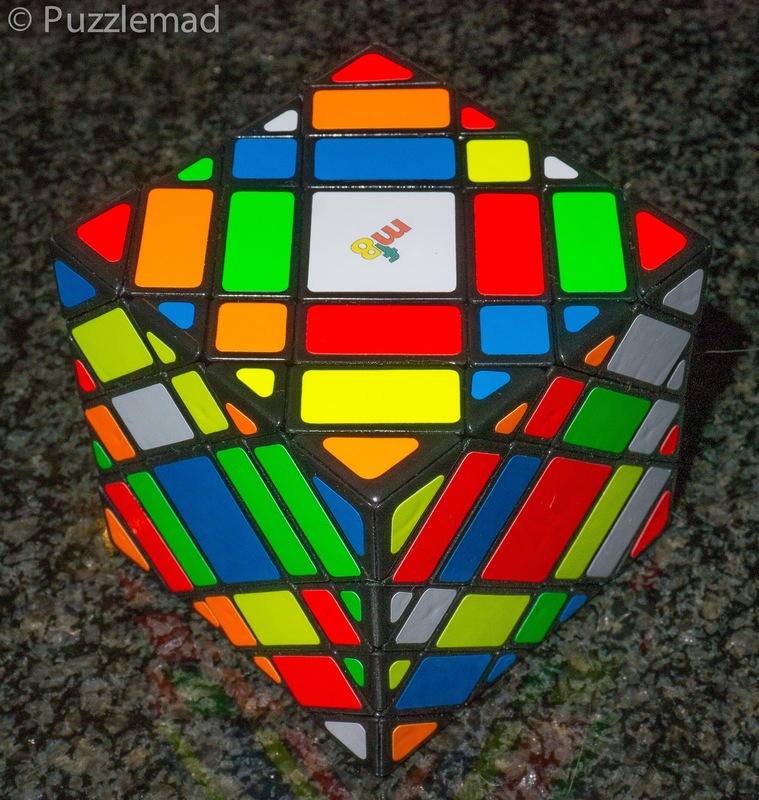 When Jakub offered me another similar puzzle I jumped at the chance. 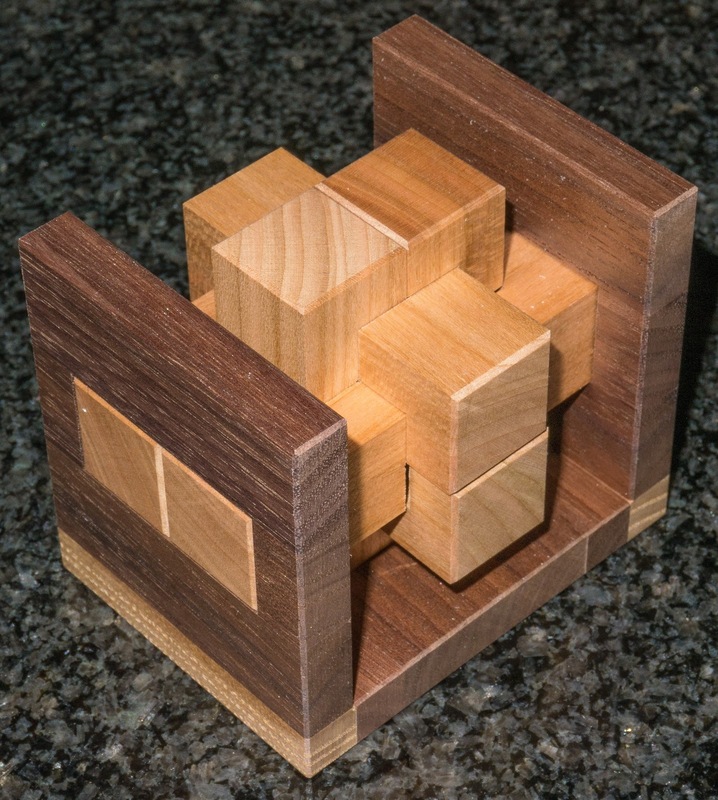 This is a good bit bigger than the other puzzles at 96mm cubed and will be available in 5 combinations of wood: mine is Zebrano with an Applewood frame, there will also be Purpleheart and Maple, Wenge and Cherry, Ipe and Maple as well as Merbau and Apple - I have seen the photos and they are ALL fabulous! These puzzles share the 8x8x8 voxel grid that the constrained burrs have but here the frame that restricts the burr is narrower. The quality of craftsmanship is astounding making this one an absolute delight to play with. The sequence discovery is wonderful to work through and with a level 14.2.5.3.5.5 disassembly with a couple of very well hidden moves, this is certainly a significant but enjoyable challenge. I got stuck on a couple of occasions and struggled to both backtrack and go forward. The full disassembly took me about 45 minutes before being left with a precariously balanced arrangement of sticks on a sleeping cat. Yes, yes, yes! I know that's a silly thing to do! I know I have been caught out by that before but I am not very bright and the cat was really deeply asleep...or so I thought! The cat woke up, stretched and turned over leaving me with a pile of sticks on my lap and one on the floor and no idea which one went where! Burrtools required for the reassembly? Actually not! 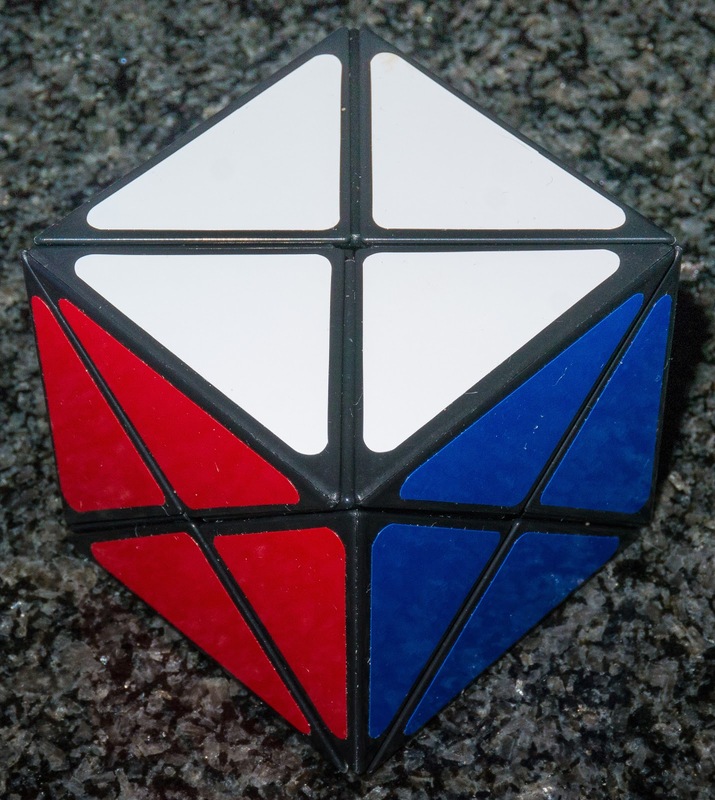 This puzzle is actually solvable in reverse from scratch with a bit of patience and just a little awareness of the initial disassembly - it did take me quite a long time, but eventually, it went back together without computer help. Not only does this puzzle look fabulous but it is a superb and enjoyable challenge. So which should you buy? This is a very tough call - I personally would buy the whole lot - indeed I did! If you are not a burr puzzler then you could skip Aracna, but the burr zoo is a very fun subgroup to focus on. If you can only buy one then I would choose Blocage, if you have Addition already then Math is an essential addition to the collection. So many choices - Pelikan are probably the best puzzle craftsmen in the world just now and you will not regret buying any of them - I cannot resist getting everything they produce (I am very aware that I am lucky in having a well-paying job). 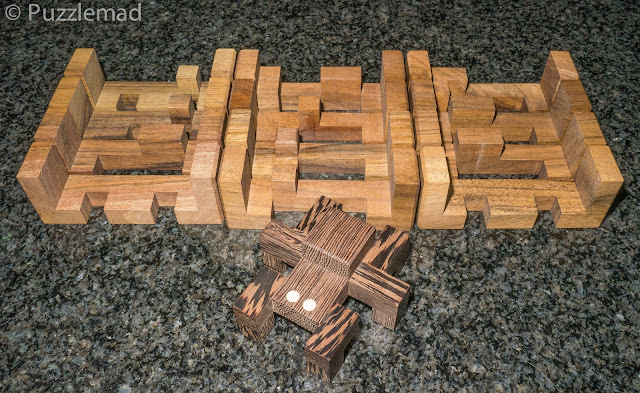 Having disassembled the 136 minute puzzle at the end of the last post, I contemplated a more challenging reassembly - the puzzle had been sent out with an extra piece with a more complex pathway etched in it. It took several days to do it (I did get lost a couple of times but not too far down the wrong pathway before realising it) - the "205 minute box" is finally assembled after 12,282 moves! I don't think I will be taking it apart any time soon. 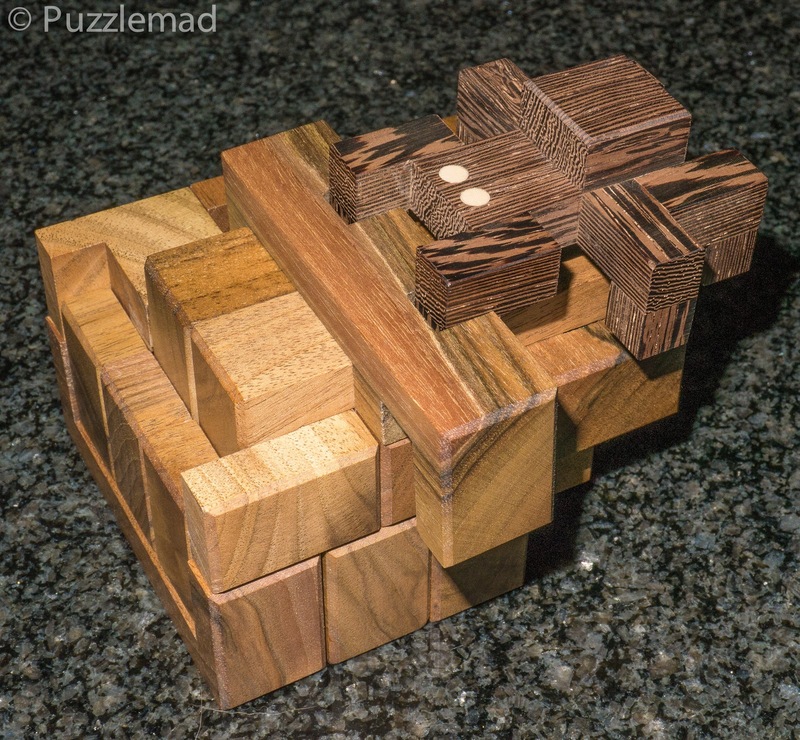 Aleksandr has created a fantastic quality N-ary puzzle here!